Much of the world’s economy depends on the Internet, and keys and certificates are the foundation of online security. They secure communications and provide authorization and authentication. Global enterprises depend on the trust, privacy, and integrity established by keys and certificates. 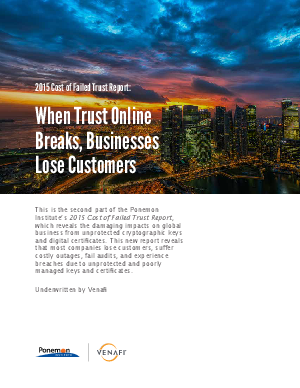 This second part of the 2015 Cost of Failed Trust Report, looks at how the failure to secure and manage keys and certificates is adversely impacting today’s businesses, and quantifies the direct financial impacts. Download this new report which reveals that most companies lose customers, suffer costly outages, fail audits, and experience breaches due to unprotected and poorly managed keys and certificates.